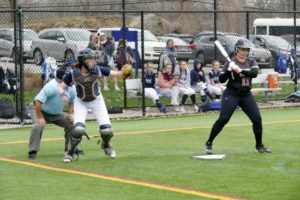 Five o’clock Friday is a strange time to play a high school softball game, especially when the opposing team arrives at six and it’s drizzling. 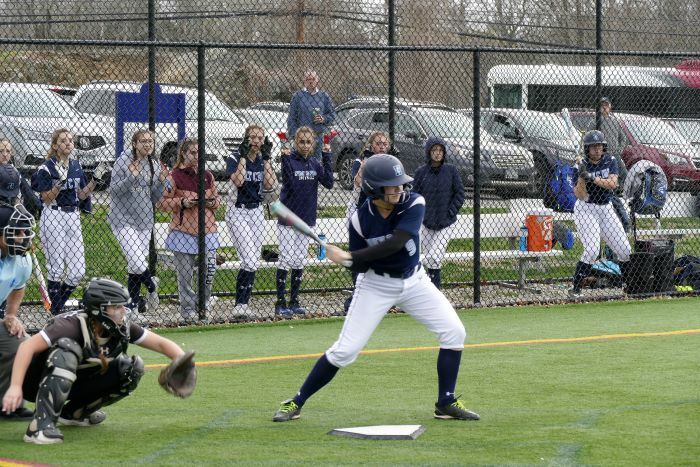 That’s what Holy Child’s softball team endured April 12 against Kingswood-Oxford from West Hartford. The game was called due to darkness and rain at the end of four innings with the score knotted at five. Holy Child took a 3-2 lead in the bottom of the second. Leadoff batter Lindsey Ricciardi hit a long solo home run fly ball to leftfield. The next batter, McGovern, walked. Ariana Ujkaj hit a hard groundball single past second base, moving McGovern to second. The next batter struck out, but the Gryphons executed a beautiful double steal. Alex Lamassa hit a sac fly RBI over first base, driving in McGovern. Shelby Smith smacked a long single RBI to centerfield, driving in the third run. The Gryphons suffered some unfortunate mishaps in the top of the third. There were a few hit by pitch players on base and McGovern walked in a few runs. She redeemed herself by making a fabulous play for the third out. She fielded a difficult back to the mound slow roller and threw the runner out at home. Holy Child got two runs in the bottom of the fourth to tie the game. Lamassa smacked a triple over the centerfielder’s head. Charlotte Hurley had an RBI double. Caroline Bryceland tied it up with an RBI double to center left.